Transported by the swirling winds that illuminate the coasts of the eastern sea, the BandAdriatica rages on the agitated waves of Salento music with elements of all the Mediterranean sonic coasts as a complex “Babylon”, where the languages begin to harmonize on the popular melodies in the mestizo fervour of the harbours. That’s how the Apulian traditions take on a new resonance, starting from the frantic echoes of Salento music found in the sounds of folklore festivals, processions, funerals, serenades and night trips, taking it from country to country in ten years of research on the common musical matrices of the banks of the Adriatic Sea, reflecting themselves in the music of Albania, Macedonia, Croatia, the Serbian fanfare, North Africa and pushing up to the eastern Mediterranean. The performance of the band has fascinated the critics at Babel Med 2017 in Marseille who defined it as “one of the best proposals of the whole Festival” and “one of the best Italian live-act”. 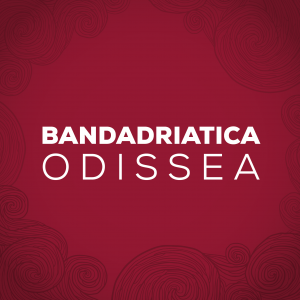 BandAdriatica has collaborated with artists such as Bombino, Mercan Dede, Rony Barrak, Savina Yannatou, Chieftains, Burhan Ochal, Kocani Orkestar, Boban Markovic Orchestra, Fanfara Tirana, Eva Quartet, Cafer Naziblas, Fanfare Ciocarlia e Michel Godard. “A salty survey of pan-Mediterranean Sounds…Babilonia … it’s a great integration of Balkan and Italian brass-band styles, local traditional music, Middle Eastern tempos and new songs from their home sung in the local dialect”. ODISSEA (transl. “Odyssey”) is the title of the band’s new recording project that explores the sounds of North African music that the band has been practicing for some time. The original inspiration, born from the collaboration with the many artists met along the way in concerts and festivals, has been enriched by extensive research and targeted listening, and has led to a combination of the sounds of wind section and ” organetto” (which recalls south Italy and the Balkans) with the gnawa rhythms and a sinuous ‘Saharan’- inspired electric guitar. The original lyrics, a combination of myth and current events, tell the stories of migrants (as in Odissea and Migrante), sometimes with irony (L’idea), other times in a poetic language (Stella della notte). The Odyssey of Ulysses is trapped in the figure of the migrant, who plows the seas to find himself or to improve his life conditions. The Mediterranean has always been the sea of returns, this fully reflects in the stylistic elements found in BandAdriatica’s work: sounds coming from apparently distant countries mix together and unveil their common origin; the music travels simultaneously forward, driven by the experimentation, and back in time, in search of its identity. BandAdriatica is the only Italian band selected for the showcase at Babel Med Music Marseille 2017 (France). It has also appeared in other important international festivals such as: Ethonopolis (Slovenia); Kulturforum Amthof (Austria); Festivali i Këngës 48 (Albania); Festival Italiana Kulturbrücke am Rhein (Germany); Zomer van Antwerpen (Belgium); Vidor Fesztivál (Hungary); Fira Mediterranea de Manresa (Spain), International Gipsy Festival (Holland); Babel Sound Fesztivál (Hungary); Malta World Music Festival; Rialto World Music Festival (Cyprus); Demanda Folk Festival (Spain); Zürcher Theater Spektakel (Switzerland); Le Bal Rital (France and Belgium); Labadoux Festival (Belgium); Semaine Italienne (France); Openair Wipkingen (Switzerland); Folk Holydays (Czech Republic).